Working on trials, both before, during and after, is an exciting task for the right person. Think you need to go to law school to live out your courtroom dream? Think again. There are more people working on litigation teams than you ever see sitting in a courtroom. It takes a lot of work to sift through all the moving parts of a case. If a career in litigation is something that appeals to you, check out three things you should know about the support specialist role. One of the main tasks that a litigation support specialist must do is organize thousands of pieces of paper. Even in the current technology-laden office environment, paper still rules the day in the legal field. While you will utilize computer organization as well, you still have to take care of the hard copies. If you are highly organized and can remain focused amid redundant and consuming files, you may be a good fit for the position. In litigation, a matter can hinge on a technicality. Every detail matters. Research and attention to detail are critical components of all facets of courtroom work. An individual should be able to sift through documents, articles, case law and be ready to provide detailed summaries to make the attorney’s job easier. Litigation can go from a snail’s pace to a sprint in a matter of minutes. Thinking fast on your feet and being able to shift gears quickly are requirements of the job. If you find yourself resistant to change or unable to multitask, a support specialist position may not be the best fit. Litigation support is crucial in businesses and law firms around the country. 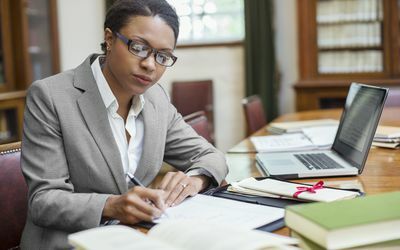 People who have an interest in a fast-paced, challenging career, but don’t want to go through law school may find this type of job the perfect balance.